The FT reports that senior executives at several of the largest US banks have privately told the Trump administration they feared the prospect of a Labour victory if Britain were forced into new elections. It then referred to a report by analysts at Morgan Stanley arguing that a Corbyn government would mark the “most significant political shift in the UK” since Margaret Thatcher’s election and may represent a “bigger risk than Brexit” to the British economy. It predicted snap elections next year, arguing that the prospect of a return to the polls “is much more scary from an equity perspective than Brexit”. He warned global banks that operate out of the City of London that he would indeed be a “threat” to their business if he became prime minister. He singled out Morgan Stanley, the US investment bank, for particular criticism, arguing that James Gorman, its chief executive, was paying himself a salary of millions of pounds as ordinary British workers are “finding it harder to get by”. 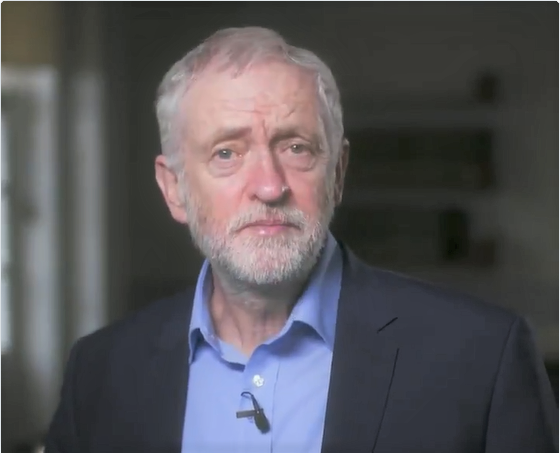 Corbyn blamed the “greed” of the big banks and said the financial crisis they caused had led to a “crisis” in the public services: “because the Tories used the aftermath of the financial crisis to push through unnecessary and deeply damaging austerity”. The FT points out that donors linked to Morgan Stanley had given £350,000 to the Tory party since 2006 and Philip Hammond, the chancellor, had met the bank four times, most recently in April 2017. The bank also had strong ties to New Labour: “Alistair Darling, a Labour chancellor until 2010, has served on the bank’s board since 2015. Jeremy Heywood, head of Britain’s civil service, was a managing director at Morgan Stanley, including as co-head of UK investment banking, before returning to public service in 2007”. In Norway, you can walk into your local library or central council office and see how much tax your boss paid, how much tax your councillor paid, how much tax your politician paid. This means major tax avoidance, complex schemes, major offshoring, etc, is almost impossible, because it combines morality and social morals with ethics and taxation. We need to minimise this offshoring and tax avoidance; but the people in control of the information media flow, plus the politicians, rely on exactly these methods to increase their cash reserves. But first give hope to many by electing a truly social democratic party. 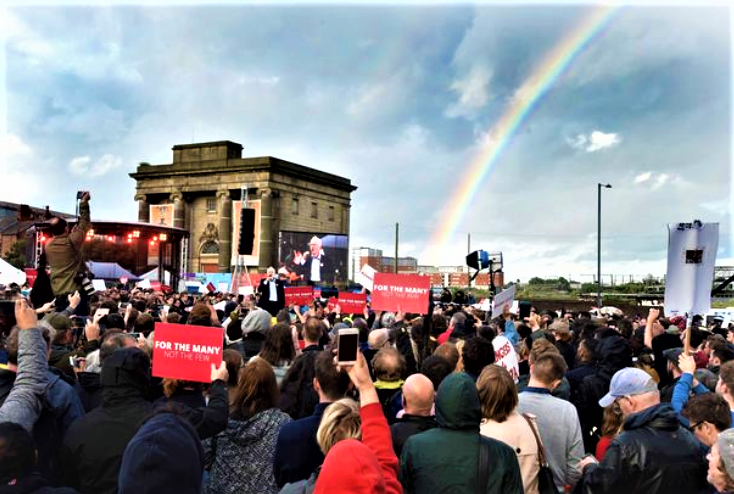 Is the rainbow suggesting a new party logo? Cuts protest during the last Prime Minister’s Questions session before parliamentary recess. Support given by Labour’s shadow chancellor John McDonnell and Green leaders, Jonathan Bartley and MP Caroline Lucas. In their evidence to the Fifth Independent Review of the Work Capability Assessment (WCA), the BMA repeated its 2012 call for government to end it “with immediate effect and replace it with a rigorous and safe system that does not cause avoidable harm to the weakest and most vulnerable in our society”. In 2014, it was reported that David Clapson, a diabetic, had been found dead in his home. His benefits had been cut, he had no food in his stomach and the fridge that stored his insulin was not working because there was no credit on the electricity card. A senior North London coroner spoke out, highlighting his inquest verdict that ‘Mr A’s’ suicide was triggered by a ‘fit for work’ assessment. In 2010 Coroner Tom Osbourne blamed the death of Stephen Carré on a decision by the Department for Work and Pensions that the Employment and Support Allowance claimant, who was clinically depressed, was fit for work following a work capability assessment. The suicides of Michael O’Sullivan and Julia Kelly, were also blamed on the result of work capability assessments by their respective coroners. An academic paper, published in the BMJ’s Journal of Epidemiology and Community Health in which examined 149 English council areas, found that nearly 600 suicides in England may be associated with the government’s “fit-for-work” tests. Oxford and Liverpool researchers looked at three years’ data and also found the Work Capability Assessments could be linked to a rise in mental health problems. The BBC reports that the study found the areas with most WCAs showed the sharpest increases. Disability rights campaigners, mental health charities and the families of claimants who killed themselves, or died after cuts to benefits, have argued that 49 DWP secret investigations or “peer reviews” into the deaths of claimants should be published. In April (2016) a decision was made by the First-tier Information Rights Tribunal that, pending any appeal by the DWP or the Information Commissioner’s Office, the government would have to hand over details of the circumstances of 49 deaths concerning claimants on benefits. The DWP was given five weeks to resolve the matter. In May, following the successful legal challenge – John Pring v IC & Department of Work & Pensions – the DWP released the peer reviews of these cases but with many key words blacked out (redacted) and a Labour spokesman accused the Government of “rewarding failure” – giving new contracts to Capita and Atos. Changes to benefits “disproportionately affected” disabled people, the UN Committee on the Rights of Persons with Disabilities (CRPD) found. The investigation was launched after receiving evidence from disability organisations about an “alleged adverse impact” of government reforms on disabled people. UN committee members visited London, Manchester, Birmingham, Cardiff, Edinburgh and Belfast in October 2015 to identify any gaps in human rights protection for disabled people. As part of its inquiry, the CRPD also looked at a range of recent welfare reforms and legislation including the Welfare Reform Act 2012, Care Act 2014, and Welfare Reform and Work Act 2016. The BBC reported the UN inquiry’s conclusion that changes made to housing benefits and criteria for parts of the Personal Independence Payment, combined with a narrowing of social care criteria and the closure of the Independent Living Fund, “hindered disabled people’s right to live independently and be included in the community”. ITV News: the Motability charity, which allows disabled people to pay for specially adapted cars, from their benefits, reports that 900 people a week are having cars, scooters and even motorised wheelchairs taken from them – some losing their jobs as a consequence. Motability also reports that 51,000 people have been taken off the scheme after a reassessment for personal independence payments (PIP) since it was launched in 2013 – 45% of all cases. 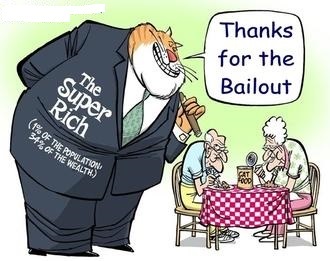 The benefits budget is being repeatedly cut to pay for the ‘bailouts’ following the banking crisis and people are stripped of disability benefits or having them reduced by half. This is causing pressures which can leave them too sick to work, too poor to support themselves and too tired and frightened to appeal against these damaging decisions. Even in comfortable ‘middle England’ the number of people who find this victimisation shameful and seek radical political change is growing. In 2016, though the price of oil was low, average bus fares rose three times faster than the consumer prices index. The statistics report presented by government for 2015/6 was precise: “Between March 2011 and March 2016, the average annual percentage change in bus fares was 3.8% higher than the average annual rate of inflation (2.3%)”. Families who can’t afford a car can find travelling by bus costs more than taking a taxi. Theresa May: “We will do everything we can to give you more control over your lives” (first speech as leader). Without accessible or affordable transport, adults in ‘just about managing’ [JAM] families will be less able to travel to work or to medical and other appointments. Some feel compelled to go into debt to buy cars they wouldn’t need if bus services were reliable and affordable..
Due to government funding cuts, town hall chiefs have announced that councils have been forced to reduce bus services by more than 12% in the past year. They are calling on the Government to fully fund the Concessionary Fares scheme, and for the devolution of the £250m Bus Service Operators Grant scheme that refunds some of the fuel duty incurred by operators of registered local bus services. The grant was kept at 81% until April 2012, when it was reduced by 20%. The current payment rate is the lowest ever percentage since the rebate’s inception in the 1960s. Theresa May: “When it comes to opportunity, we won’t entrench the advantages of the fortunate few, we will do everything we can to help anybody”. But government actions belied these fine words; her chancellor announced a fuel duty freeze which – he said – will cost taxpayers a predicted £850m in the first year alone and really help the ‘fortunate few’ running the largest cars, not the JAM families. The recent by-elections gave cover for the latest government announcement of emergency legislation inflicting further cuts on disabled people – ‘a good day to bury bad news’. Two tribunals had ruled that the Department for Work and Pensions (DWP) should expand the reach of Personal Independence Payment (PIP) – which helps disabled people fund their living costs. One ruling found that someone who needed support at home to take medication or monitor a health condition like diabetes would score the same on the benefits criteria as people who needed help with a demanding procedure such as kidney dialysis. A second ruling said people who struggled to travel independently because of conditions such as anxiety scored the same as someone who was, for example, blind. Ministers then swiftly revised the law to deny the increased benefit payments to more than 150,000 people. From April, it is reported that new claimants will see a reduction of £29.05 in their entitlement, which will fall to £73.10 a week. This follows on from the cuts that the DWP tried to implement last year, which resulted in Iain Duncan Smith’s resignation. Unfortunately this logic, and a host of scathing comments seen in the Metro won’t pierce the thick skins of affluent legislators and further deprivation will hit the least fortunate in many sectors. Government proposals to force the 89 local government pension funds to invest in infrastructure projects have prompted over 100,000 people to sign a petition calling for a debate in Parliament, says UNISON today (Friday). The proposals are part of the government’s attempt to create six new multi-billion pound British wealth funds. UNISON is concerned that the move could take away funds’ ability to invest in the best interests of local government pension scheme (LGPS) members. If these changes come into force, it could mean the new funds replace government funding for roads, bridges and railways, which might not give LGPS members the best possible return, says UNISON. UNISON general secretary Dave Prentis said: “It’s time ministers granted a debate in Parliament on the future of the local government pension scheme. No other pension fund in the UK has this level of interference, and it’s important that MPs can scrutinise proposals affecting one of the largest schemes in the UK. “There must be proper consultation on the introduction of the new wealth funds, one that must involve unions in any investment decisions. The ‘thin end of the wedge’? We have recently consulted on proposals to grant the Secretary of State a power of intervention . . .
We have recently consulted on proposals to grant the Secretary of State a power of intervention which would further protect members’ and taxpayers’ interests. We expect that the power to intervene would be used exceptionally when there was clear evidence that a pension fund authority was not acting reasonably and lawfully. The Government is currently considering the responses to the consultation. – The text of the parliamentary petition is available here. Nearly 103,000 people have currently signed the petition. Parliament’s own website heads the summary of the Committee of Public Accounts report on Revenue and Customs: “HMRC still failing UK taxpayers”. “HMRC must do more to ensure all due tax is paid. The public purse is missing out and taxpayers expect and deserve better. “We are deeply disappointed at the low number of prosecutions by HMRC for tax evasion. We believe it is important for HMRC to send a clear message to those who seek to evade tax that the penalties will be severe and public. It’s also important that the majority who play by the rules, paying their tax on time and in full, see that those who don’t will face the consequences. “Tax avoidance also remains a serious concern. Too many avoidance schemes run rings around the taxman, operating legally but gaining advantages never intended by Parliament. If tax law is to be improved then HMRC must as a priority provide Parliament with comprehensive details of avoidance. HMRC must also rapidly improve its customer service, previously described by the PAC as abysmal and now even worse – to the extent it could be considered a genuine threat to tax collection. Having seen the PCU website, a publisher who published a book which highlighted the damage done by corporate lobbying some years ago, asked if there are any other books which deal with the malign effect of the corporate/political nexus. A clear, detailed and forceful description is given of the way in which major accountancy firms, some of the world’s biggest corporations, operating behind a veil of secrecy and through global networks, have diversified into tax avoidance, consultancy and any other activity that will make a quick profit. Despite numerous audit failures, the ‘colonisation’ of senior civil servants, current and former ministers has enabled them to escape effective regulation and retribution. The colonised include Peter Mandelson, former Labour Secretary of State for Trade & Industry, who became adviser to Ernst & Young; Sir Malcolm Rifkind, the former Conservative foreign secretary, who for some years has been an adviser to PricewaterhouseCoopers (PwC); former Inland Revenue chairman Sir Nicholas Montagu who joined PwC and the former head of the Treasury’s transport team, Lewis Atter who joined KPMG in 2004. Mitchell-Sikka’s recommendations for beneficial change will be placed on the website tomorrow. *ISBN 1-902384-09-1, © Association for Accountancy & Business Affairs. Can be downloaded from here in pdf format.